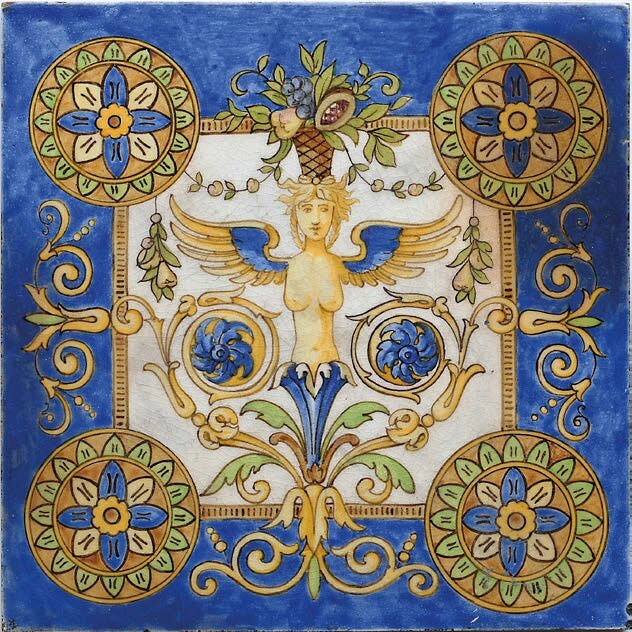 A rare hand-painted Villeroy & Boch tile from Germany, c.1880, is offered on the site of Richard Hoppé Antiques for £225. It features a polychrome winged siren figure painted over a square white central ground. She is shown under an overflowing basket of fruit and leaf tendrils, emerges from a trumpet flower with foliate scrollwork shoots terminating in blue flower heads and is surrounded by four floral medallions over a blue ground wash to each of the corners. It has the mark Villeroy & Boch Mosaikfabrik in Mettlach impressed to the reverse and measures 8in (20cm) square. Hoppé, a member of LAPADA and the International Perfume Bottle Association, specialises in European glass and tiles, which became an interest during his 25 years of working abroad. Current stock and an archive of sold items are available on his website.